In the news for the week ending February 22, 2019, are more cookies, fewer shoes, black lagoons, ranch dressing, and more. Tagalongs, Samoas, and S’mores, Oh My! There’s a Christmas episode of Friends where Ross breaks a Girl Scout’s leg. It was an accident, of course — Ross was showing Chandler how to swing a tennis racket and accidentally hit the girl, called a Brown Bird and not a Girl Scout for what I assume were trademark reasons. So he decides to help the girl sell her cookies so she can win a trip to space camp. Like anyone would do, he forces his friends and family to buy some, including sister Monica, who decides to buy only one box because she had the serious problem of eating too many of them when she was younger. I had the same problem. I remember eating an entire box of Samoas in one sitting. My God are they good, with the coconut and the caramel and the chocolate. I haven’t bought them in several years, but Keebler sells their own version, called Coconut Dreams, and they’re just as good. But if your store doesn’t sell them, or if those cookies just aren’t your thing and you want to help your local Girl Scout, we’re right in the middle of the official selling season. Whether you know them as Peanut Butter Patties or Tagalongs, Shortbread or Trefoils, Samoas or Caramel deLites (yes, the cookies have different names depending on where you buy them), you can get them at a cookie booth near you or online. Of course, if you want to buy Girl Scout cookies in 2019, there’s an app for that. Nobody wants me to own sneakers. That’s the only conclusion I can come to, as the two places where I’ve always purchased sneakers have closed. First, the Sears closest to my home shut down after many decades — and who knows how long any of the stores will remain open despite a recent save and new plans — and now Payless has declared bankruptcy and will close all 2,100 of its U.S. stores. I guess I’ll have to find some place else for my sneakers and shoes. I’m certainly not going to walk around like Fred Flintstone. While doing some googling on the life of Creature from the Black Lagoon star Julie Adams, who died two weeks ago, I came across a new book with the fantastic title The Lady from the Black Lagoon. It’s the story of Milicent Patrick, a woman most people have never heard of (I certainly hadn’t), who designed one of the most famous monsters in monster movie history. She created the creature’s suit, yet she has never been honored for her work. Her name was even left off the film’s credits, so it’s great that her story is finally being told. Peter Tork was the bassist and keyboardist for The Monkees, a fake band that was put together for a ’60s sitcom but eventually became a real phenomenon. Tork was a talented musician and was the only member of the group who actually played on the group’s first two albums (session musicians did most of the work). The band toured for decades, got together for many reunion tours, and released a new Christmas album in 2018. Tork died earlier this week at the age of 77. Karl Lagerfeld was one of the most iconic fashion designers of the 20th century. He died Tuesday at the age of 85. Bruno Ganz was a veteran actor who appeared in films such as Wings of Desire, Nosferatu, The Reader, The Boys from Brazil, and Faraway, So Close! In recent years, he had become a viral sensation when footage of his acclaimed role as Adolf Hitler in Downfall became a funny internet meme. He died last week at the age of 77. Lee Radziwill was the sister of Jackie Kennedy Onassis who, after a short time as an actress, had a career in interior design and public relations. She died last week at the age of 85. Don Newcombe was the first black pitcher to appear in a major league baseball game, the first winner of the Cy Young Award (twice), a four-time All-Star, and helped the Los Angeles Dodgers win a championship after a stint in the military. He died this week at the age of 92. George Mendonsa was the man in one of the most famous photographs in history, the Life cover showing a sailor kissing a woman in Times Square at the end of World War II. He died last weekend at the age of 95. Greta Friedman, the woman in the picture, died in 2016. David Horowitz was for years a staunch advocate for consumers, appearing on various stations around the country with his “Fight Back!” segments. He also had a syndicated column and appeared on many talk shows. He died last week at the age of 81. Christopher Knopf was the screenwriter for such films as Emperor of the North and 20 Million Miles to Earth, as well as TV shows like Equal Justice, The Big Valley, Cimarron Strip, and Dr. Kildare. He died last week at the age of 91. With the 2020 campaign already started — it’s only February 2019! — I think this woman speaks for all of us. We all just want some ranch. The man with one of the greatest names in political history ran for president twice, once in 1940 and again in 1944. In poor health, he died just six months after leaving the 1944 race. You can read every issue of The New Yorker online. Hey, it’s not as great as our archive, but it’s pretty good! This Constantin Alajálov cover would be controversial today. 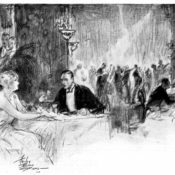 Not for the illustration itself — which is a rather innocuous, humorous look at a new bride who burns dinner, forcing the couple to go out to a restaurant — but for the title. It would cause a social media uproar. Saturday, February 23, is the night to open that very special bottle of wine that you’ve been saving for the past few years. If you’re the type that saves bottles of wine for special occasions, that is. I’ve always been the type of person who buys a bottle of wine and opens it right away. Wait, that makes me sound like I have a problem. I’m just saying that I’m not the type of person who has several bottles of wine in my house, whites for this and reds for that, an expensive bottle waiting for a special night or major announcement. I say just view this as the night to open up any bottle of wine you enjoy. A Tawny Port might be good with some Tagalongs. It’s just like the Academy Awards, only it celebrates independent film, it’s held on a beach, and there’s an actual host (Aubrey Plaza of Parks and Recreation). It airs on IFC at 5 p.m. ET. The Academy changed their mind after a backlash, and they will indeed air all of the award categories. But there’s still no host. Let’s see how that works out. Here’s a printable PDF of the nominees so you can play along at home, starting at 8 p.m. ET on ABC. I bought some S’mores outside my local Albertson’s last Friday from the Girl Scouts. They’re still unopened in their plastic ‘un-box’. Hopefully the weather will be better for these girls and their mothers coming up, being outside as they are. Sorry to hear Payless has left and gone away. You can try Ross and/or Burlington Coat Factory for your sneakers and shoes, if they’re not too far. I get mine there, plus Eternity, Joop and Cool Water (at Burlington) for more than half off the retail price. One of my favorite colognes in the ’90s was the Lagerfeld ‘Photo’. An incredible scent, for sure. Sorry to read he passed away last week, but Peter Tork especially. He was a great entertainer and musician. He enriched my life starting at age 9 in Sept. 1966 with the fun ‘Monkees’ TV show, making it happier and brighter. Peter and Micky Dolenz were/are my two favorites of the great American Fab Four.